On April 11, 2013, President Barack Obama awarded Chaplain (Captain) Emil J. Kapaun (1916-1951), b. Pilsen KS, of Czech immigrant parents, the Medal of Honor for conspicuous gallantry. 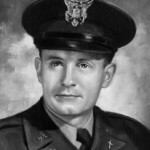 Chaplain Kapaun received the Medal of Honor posthumously for his extraordinary heroism while serving with the 3d Battalion, 8th Cavalry Regiment, 1st Cavalry Division during combat operations against an armed enemy at Unsan, Korea and as a prisoner of war from November 1-2, 1950. When Chinese Communist Forces viciously attacked friendly elements, Chaplain Kapaun calmly walked through withering enemy fire in order to provide comfort and medical aid to his comrades. When they found themselves surrounded by the enemy, the able-bodied men were ordered to evacuate. Chaplain Kapaun, fully aware of his certain capture, elected to stay behind with the wounded. As hand-to-hand combat ensued, he continued to make rounds. As enemy forces approached the American position, Chaplain Kapaun noticed an injured Chinese officer amongst the wounded and convinced him to negotiate the safe surrender of the American forces. Shortly after his capture, Chaplain Kapaun bravely pushed aside an enemy soldier preparing to execute a comrade, thus saving a life and inspiring all those present to remain and fight the enemy until captured. Chaplain Kapaun’s nephew, Ray Kapaun, and family joined the President at the White House to commemorate his example of selfless service and sacrifice.